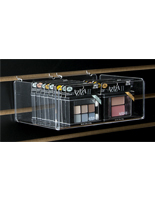 These plastic bins are perfect for displaying trial-size products! We stock 100s of other slatwall accessories & fixtures as well! These slatwall plastic bins are small containers designed to hold sample products, bulk merchandise, and other small, loose items. 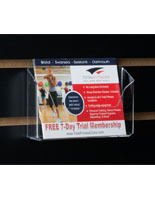 Measuring 5 ½"w x 11"d, these plastic bins fit all of our slatwall displays, kiosks and panels. 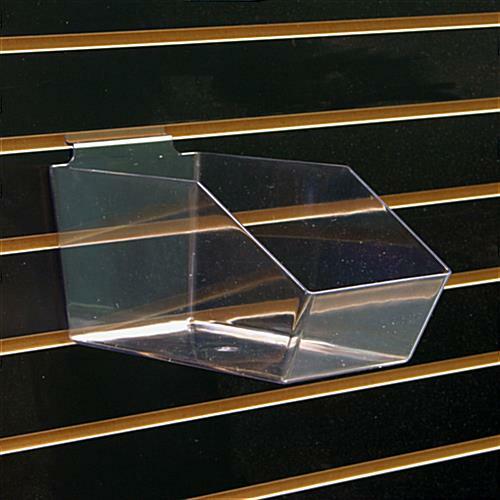 Also called shelf bins, these plastic bins easily attach to any of our slatwall fixtures without the use of any tools, adhesives or mounting materials. 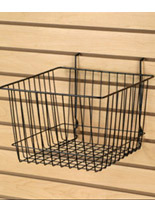 Just slide the hook into your slatwall panel and fill the bins with products! 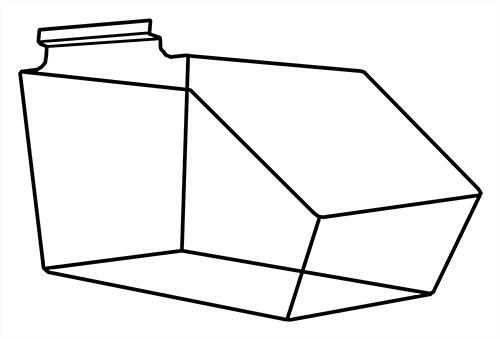 Made with clear materials, these plastic bins are simple, yet durable products that will not break or scratch easily. 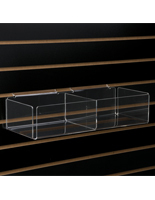 Slatwall containers like these plastic bins are great for retail, convenience, and grocery stores that have small products or samples to display. These plastic bins are perfect for holding candy, travel products, cosmetics, and other small merchandise. With 5 ½" high walls on three sides, you don't have to worry about your products spilling over when customers rummage through them. In the front, the shelf bins angle downward to allow your customers easy access to your contents. Because these plastic bins are made with colorless acrylic, they will clearly showcase your items and will look great in any décor. 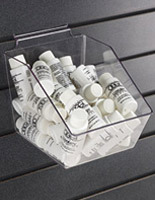 Mix and match these plastic containers with other accessories to create customized displays. Since the shelf bins attach so easily, you can change around your displays or restock your products whenever you need to! 5.5" x 5.5" x 11.5"